Auckland is an especially popular holiday destination in New Zealand, with the surrounding beaches proving to be a major draw card for tourists. The coastline offers up a multitude of related attractions, ranging from sunbathing and swimming, to water sports such as diving, snorkelling and even surfing. In total there are a staggering 100+ beaches within driving distance of central Auckland, meaning that choice is certainly extensive. Most tend to be simply categorised by region, being described as either north, east or west. Particularly close to Auckland city centre are those located along the East Coast, where the beaches off Tamaki Drive are highly suitable for families. Both Judge's Bay and Mission Bay are also very child-friendly. Swimming is best at high tide and the West Coast beaches are good for swimming, although the sea can be rough at times, so care should always be taken. For some of the best swimming around Auckland, consider heading to Piha Beach in the West, Brooks Beach, Cornwallis and Omana, on the outskirts of the city centre, or perhaps Takapuna Beach on the North Shore. The city's impressive beaches are home to excellent facilities, such as busy waterfront restaurants, cafés, pubs and bars, often with magnificent coastal views. Beaches in Auckland are also suitable for water sports, seaside ball games and outdoor picnics, and many feature gas barbecues and playground areas for children. Seasonal inspectors and volunteer lifesavers are a regular sight on the busiest stretches. 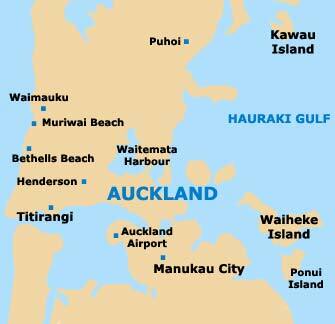 Across Waitemata Harbour you will find an impressive selection of beaches, stretching north to the Whangaparaoa Peninsula, around 40 km / 25 miles from Auckland. 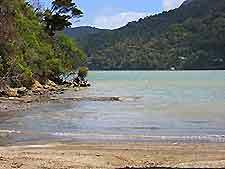 Also, the nearby island of Waiheke, in the Hauraki Gulf, is full of small secluded spots, with sheltered, clear water suitable for bathing. Bethells Beach resides within the northern suburbs of the city, where it is home to strong breaks and large waves, attracting experienced surfers. Cliff-top walks are also a popular activity at Bethells and offer views of the coast. Bream Bay is to be found on the city's northerly outskirts and is one of the most breathtaking coastal stretches in the area, being easily reached from the centre by car. Nearby you will find good facilities, including a number of shops and cafés. Brooks Beach is situated outside of the city and serves as a popular excursion. Featuring a range of activities, including swimming and sunbathing, other attractions at Brooks include scenic picnic spots, coastal walks and a nearby camping site. Cornwallis Beach, on the outskirts, is a peaceful spot that is suitable for a range of coastal activities, including swimming, sailing and windsurfing. Cornwallis is within easy driving distance of the city centre. Located on the south-western coast, Karekare Beach has many coastal walks and strong waves, suitable for only the most experienced of surfers. Long Bay Beach is situated on the North Shore and stretches along the coast for more than 1 km / 0.6 miles. This spacious stretch contains picturesque views, barbecue facilities, picnic spots, a children's playground and a nearby restaurant. Mission Bay Beach, on the eastern outskirts, is a large expanse with fine sand and excellent amenities, including a children's playground area and an array of nearby cafés. Muriwai Beach is situated on the western outskirts and features many attractions for families, including picnic areas and a children's playground. Other attractions at Muriwai include striking black sand and regular strong waves, attracting keen surfers. Omana Beach, on the outskirts of southern Auckland, has many scenic coastal walking trails, picnic spots and calm water suitable for swimming, while children will enjoy exploring the rock pools, looking for small crabs and rock oysters. This beach is part of the Omana Regional Park and is roughly a 40-minute drive away, with kayaking and volleyball being popular here. Bird watchers will enjoy identifying the plentiful species of birds living here, with almost 30 recorded species found within the park, including both the New Zealand pigeon and the red-billed gull. Oneroa Beach is best known for its fine white sand, blue waters and breathtaking views of the Hauraki Gulf. Part of Waiheke Island, Oneroa is just a short excursion away and is connected to the city by regular ferries. Onetangi Beach is a vast stretch on nearby Waiheke Island. With exceptional views of the surrounding area, Onetangi is popular with sunbathers and swimmers, and also features a secluded nudist area, suiting those looking for an all-over body tan. Orewa Beach is one of the most popular in northern Auckland. The area of Orewa has become a major coastal tourist resort in its own right, with good amenities nearby. Piha Beach, on the west coast, is known for its stretches of fine, black sand and large waves, attracting surfers from all over the North Island. Other highlights at Piha include walking trails, lifeguards, good general facilities and the prominent Lion Rock. Raglan Beach lies on the very outskirts of the city, being within comfortable driving distance of the city centre. With sheltered waters and an area with many strong waves, Raglan is suitable for both swimming and surfing. St. Heliers Beach can be found within the eastern suburbs and is home to a breathtaking seafront, with fine white sand, a playground for children and many activities, including paragliding. Takapuna Beach, on the North Shore, is a popular place highly suitable for sunbathing and swimming. Other attractions include coastal walking trails and outstanding views of the shoreline. 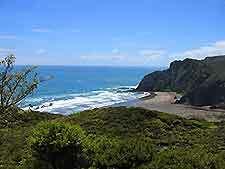 Whatipu Beach, on the western coast of the city, is a windy stretch with good surfing conditions and many excellent coastal walking trails.